Darren McFadden (born August 27, 1987) is an American football running back for the Dallas Cowboys of the National Football League (NFL). He played college football for the University of Arkansas, and was picked fourth overall by the Oakland Raiders in the 2008 NFL Draft. He attended Springdale High School in Springdale, for the fall semester of his senior year, only to move back to Oak Grove High School in North Little Rock, for the remainder of his High School career, where he was a three-sport star in football, baseball and track. He played a variety of positions for his football team, but was primarily used as a running back on offense, and a safety on defense. In track & field, he competed as a sprinter and was timed at 10.8 seconds in the 100-meter dash. 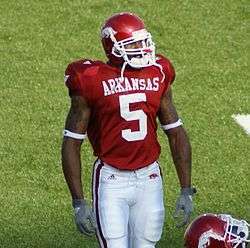 During his senior season, McFadden was a Parade magazine high school All-American in 2004, as well as the Arkansas High School player of the year for the Arkansas Democrat-Gazette. Following his senior year, he was awarded the prestigious Landers Award, given every year to the top player in the state of Arkansas. McFadden was ranked the number 23 player in the nation by Rivals.com and the number three athlete, and was given a five star rating, the highest star rating. He was a highly recruited prospect, and while he garnered interest from many schools around the Deep South including Tennessee, Alabama, and Auburn, he chose to end the recruiting process early and attend the University of Arkansas. In 2005, his true freshman season, McFadden rushed for 1,113 yards and 11 touchdowns on 176 attempts. He was an integral part of an Arkansas offense that ended up going 4–7 with close losses to Georgia and LSU. McFadden tallied over one hundred rushing yards in five games, with his best performance coming on a 31 carry, 190 yard game against Georgia. McFadden followed the Georgia game with a 187-yard effort against the South Carolina Gamecocks. McFadden also completed his first pass in a Razorback uniform in the game against LSU, when he completed a pass to Marcus Monk for thirteen yards on a critical fourth quarter drive. 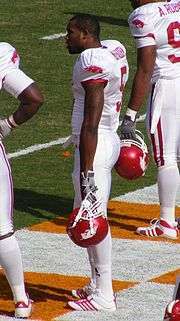 In 2006, despite a slow start due to a dislocated toe from an off the field incident at a night club in Little Rock, McFadden rushed for a school-record 1,647 yards, the fifth best all-time in the SEC for single season yards, scored 14 touchdowns, and threw for three more touchdowns on just nine passing attempts, becoming a first-team All-American. McFadden also attained a new career high for yards in a single game in his 219-yard performance in a 26–20 win against the University of South Carolina Gamecocks. Thanks to his efforts, Arkansas streaked to ten wins and the SEC Western Division Championship, but lost to Wisconsin in the Capital One Bowl on January 1, 2007 and finished with a record of 10 wins and 4 losses. At the NFL Scouting Combine in Indianapolis on February 24, 2008, McFadden ran an unofficial time of 4.27 seconds and an official time of 4.33 seconds on the 40-yard dash, which was second among all running backs at the combine to only Chris Johnson, who ran a 4.24. McFadden also reportedly scored a 17 on the Wonderlic exam. McFadden's selection number in the draft was subject to varying speculation. He was criticized for possible character concerns stemming from two nightclub altercations and the hiring of a lawyer to handle his paternity problems. McFadden was drafted by the Oakland Raiders with the fourth overall pick in the 2008 NFL Draft. The Raiders signed McFadden to a six-year,US$60.1 million contract which included US$26 million in guarantees. Contract negotiation was rapid due to Raider fears of a second consecutive contract holdout as was the case with quarterback JaMarcus Russell in 2007. At training camp, McFadden impressed Raiders coach Lane Kiffin with his ability to take instructions once and seamlessly incorporate them into his game. Media observers considered him the most complete Raiders rookie at this stage since Marcus Allen. On September 8, McFadden made in his NFL debut against the Broncos. McFadden had 46 rushing yards on 9 carries. The Raiders lost the game, 41-14. McFadden scored his first professional touchdown against the Kansas City Chiefs on September 14, 2008, his second NFL game, in which he gained 164 yards on 21 carries. McFadden also suffered an injury to his big toe in this game, which limited him for the next 14 games, including three missed games. On November 23, in a game against the Broncos, McFadden scored 2 touchdowns, his first multi-touchdown game in his career. He ended the season with 499 yards on 113 attempts, with four touchdowns. He also made 29 receptions for 285 yards. Raiders interim head coach Tom Cable, who took over after Kiffin was fired by owner Al Davis, was criticized for not playing McFadden later in the season. Responding to criticism, Cable stated “Well what really dictated was the rotation we were in, terms of the game, the flow of the game. I think [Justin] Fargas played pretty well. It’s just those situations present themselves." Oakland Tribune writer Jerry McDonald responded to Cable's statement, saying "If the flow of the game means keeping McFadden, an excellent receiving back, off the field on third down plays which call for a pass, then the flow needs to be changed by the play-caller." During the 2009 Oakland Raiders campaign, McFadden was bothered by numerous injuries and saw a career low in carries and yardage. McFadden's low point of the season came when he rushed for minus 2 yards against the Texans on October 4. McFadden started the 2010 season as a better player than he was in his first 2 seasons. 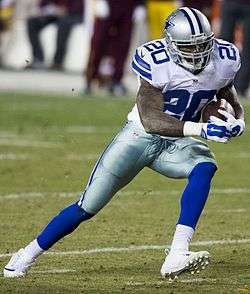 Against the Tennessee Titans on September 12, McFadden rushed for 95 yards on 18 carries. In Week 2, McFadden rushed for 145 yards on 30 carries against the St. Louis Rams. McFadden rushed for 105 yards with a rushing touchdown against the Arizona Cardinals in Week 3. McFadden missed 4 games due to a knee surgery for a torn meniscus after getting injured on Oct. 5 against the Houston Texans. Upon his return on October 24, 2010 against the division rival Denver Broncos, McFadden carried the ball 16 times for a total of 165 yards and 3 touchdowns. He also recorded 2 receptions for 31 yards and a touchdown. McFadden became only the 4th Raider to have 4 touchdowns in a game. Art Powell, Marcus Allen, and Harvey Williams were the others. On November 21, in a game against the Pittsburgh Steelers, McFadden would rush for only 14 yards. Against the Miami Dolphins on November 28, McFadden struggled again. This time, he rushed for only 2 yards on 8 carries. McFadden would get on track against the San Diego Chargers in Week 13. He rushed for 97 yards on 19 carries. In the Raiders' opener against the Broncos in Week 1, McFadden rushed for 150 yards. McFadden's 150 yards was the most ever for a Raiders running back in a season opener. The Raiders would hold on and win the game 23-20. Against the Buffalo Bills in Week 2, McFadden was held to 72 yards with a rushing touchdown on 20 carries, a 3.6 average. However, McFadden found other ways to help the Raiders. He caught 7 passes for 71 yards and scored a receiving touchdown. However, the Raiders lost the game 38-35. Against the Jets in Week 3, McFadden rushed for 171 yards, a new career high, on 19 carries to help the Raiders win 34-24. In the process, McFadden scored 2 rushing touchdowns. McFadden became the third running back to rush for 100 or more yards against the Jets in the Rex Ryan era. McFadden's performance earned him FedEx Ground NFL Player of the Week. Against the Cleveland Browns in week 6, McFadden rushed for 91 yards on 20 carries, a 4.6 average, and a rushing touchdown. McFadden returned for the 2012 season, but struggled throughout the year and finished with 707 yards on 216 carries. He did lead the Raiders in rushing, and he recorded three 100-plus-yard rushing performances. His difficulty was attributed to his continued injury problems, as he missed another 4 games during the season, and the return of the zone-blocking scheme that McFadden struggled with in his first 2 years with the Raiders. McFadden appeared in 10 games in 2013, having 114 carries for 379 yards (a 3.3 average), along with 5 touchdowns. On March 11, 2014 Oakland re-signed McFadden after the release of fellow Oakland Raider Rashad Jennings. In week 14, against the 49ers, he only carried the ball for four carries for five yards. The 2014 season marked as the first time in which Darren McFadden played a full season. He appeared in all 16 games with 12 starts. He finished the year with 155 carries for 534 yards (a 3.4-yard average) and 2 touchdowns. McFadden saw a decline in his number of carries due to the emergence of second-year running back Latavius Murray. After playing off the bench in a backup role in the first 5 games of the season, McFadden took over the lead back role in Week 7 against the New York Giants, replacing an injured Joseph Randle and totaling a season-high 152 yards rushing and a touchdown in a road loss. It was his first 100-yard game since 2013 and the first for a Cowboys running back in 2015. On June 14, 2016, McFadden underwent elbow surgery. It was an injury he suffered when he had an accident at home during the Memorial Day weekend. In June 2016, McFadden filed a $15 million lawsuit in the United States District Court for the Eastern District of Arkansas against his longtime business manager, Michael Vick, alleging that Vick defrauded him and misappropriated funds, including $3 million lost in a bitcoin-related business venture. As of 2011, McFadden had three children with three different women. 1 2 3 "Darren McFadden". Razorback Media Relations. 2005-09-07. Retrieved 2009-01-03. 1 2 Forde, Pat (2007-08-13). "McFadden's run to stardom delights mother, entire state". ESPN. Retrieved 2009-01-07. 1 2 3 4 5 6 7 8 9 10 11 12 13 "Darren McFadden". NFLDraftScout.com. Retrieved 2009-01-03. ↑ Seaton, Phillip (2009-01-14). "Pulaski Academy Quarterback Spencer Keith Wins Landers Award". KATV. Retrieved 2009-02-17. ↑ Peggy Harris, Arkansas' McFadden handcuffed, released in bar fight, Associated Press, January 10, 2008, Accessed February 17, 2009. ↑ "Wisconsin Wins Capital One Bowl, Defeats Arkansas". Associated Press. 2007-01-01. Retrieved 2009-01-03. ↑ "Rise of Troy: Buckeyes QB wins Heisman Trophy". ESPN. Associated Press. 2006-12-12. Retrieved 2007-12-10. ↑ "College Football Awards". ESPN. Retrieved 2007-12-10. ↑ "Past Honorees". Touchdown Club of Columbus. 2009-01-14. Retrieved 2009-04-26. ↑ "Top 25 NFL Draft Candidates for 2008". Sports Illustrated. Retrieved 2009-01-05. ↑ "Caddell TD caps wild finish as Bama upsets Arkansas". Associated Press. 2007-09-15. Retrieved 2009-01-05. ↑ Trister, Noah (2007-09-02). "McFadden, Jones too much for Troy; Arkansas wins 46-26". Yahoo! Sports. Retrieved 2009-01-05. ↑ "Woodson, No. 21 Kentucky rally past stumbling Arkansas". Associated Press. 2007-09-22. Retrieved 2009-01-05. ↑ "NCAA Football - South Carolina Gamecocks/Arkansas Razorbacks Recap". Retrieved 2007-11-03. ↑ Pasquarelli, Len (2008-01-14). "Arkansas' McFadden declares for NFL draft". ESPN. Retrieved 2008-01-14. ↑ "Arkansas' McFadden named Walter Camp Player of the Year". CBS Sports. 2007-12-06. Retrieved 2007-12-06. ↑ "Darren McFadden Wins Second-Straight Doak Walker Award". Hogwired. 2007-12-06. Retrieved 2007-12-06. ↑ "Chris Long Becomes Unanimous All-American with Selection to AP Team". VirginiaSports. 2007-12-11. Retrieved 2009-02-17. ↑ "McFadden skipping senior season at Arkansas for NFL Draft". NFL.com. Associated Press. Retrieved 2009-02-20. ↑ "EA Selects Darren McFadden as the First of Four Cover Athletes for NCAA FOOTBALL 09" (Press release). EA Sports. July 7, 2007. ↑ Murphy, Tom (2008-02-25). "Showing his stuff". Arkansas Democrat-Gazette. Archived from the original on April 4, 2008. Retrieved 2008-02-25. 1 2 Cimini, Rich (2008-03-30). "After home life from hell, Darren McFadden racing to put past behind him". New York Daily News. ↑ "No first-round holdout this year as Raiders sign McFadden". NFL.com. Associated Press. Retrieved 2009-02-17. ↑ Farmer, Sam (2008-08-15). "Raiders' McFadden is a can-do rookie". Los Angeles Times. ↑ "Oakland vs. Kansas City - Box Score". ESPN. Retrieved 2009-01-12. 1 2 McDonald, Jerry (2008-12-14). "News, notes and analysis from the Raiders 49-26 loss to the New England Patriots Sunday:". Oakland Tribune. Archived from the original on January 30, 2009. Retrieved 2009-01-05. ↑ "Sebastian Janikowski's record-tying FG helps Raiders hold off Broncos". espn.com. October 2, 2012. Retrieved October 18, 2012. ↑ "Foot injury likely to sideline Raiders' McFadden for rest of 2011". NFL.com. December 18, 2011. ↑ "Darren McFadden wants to forget 2012 season". MercuryNews.com. April 18, 2013. ↑ "Darren McFadden, Dallas Cowboys agree to two-year deal". ESPN.com. March 13, 2015. ↑ Patra, Kevin. "Cowboys' Darren McFadden undergoes elbow surgery". NFL. Retrieved June 14, 2016. ↑ Kissel, Kelly P. (June 9, 2016). "Cowboys' McFadden claims financial planner mishandled $15M". The Big Story. Associated Press. Retrieved 10 June 2016. ↑ Soshnick, Scott (May 9, 2011). "NFL Players Poised to Cut Alimony, Making Wives Dispute Victims". Bloomberg.com. Retrieved 10 June 2016. ↑ "Darren McFadden on hunting rabbits, says they don't taste like chicken | SportsDay". SportsDay. Dallas News. 21 March 2015. Retrieved 10 June 2016.